Brown-headed cowbirds of North America have long been known as "brood parasites" or "nes parasites". They routinely lay their eggs in the nests of other birds, then abandon the eggs. The nest owners, often warblers, are left to raise the noisy and hungry cowbird chicks, which are usually bigger than their own chicks. Warbler chicks sometimes starve, because the husky cowbird chicks take all the food. Scientists and birders have long wondered why the unwitting babysitters don't toss out the cowbird eggs and young and devote their time and energies to raising their own offspring exclusively. New observations of cowbirds and the exploited nest owners may have turned up the answer. When cowbird eggs are removed from a warbler nest, more of the warbler eggs wind up being smashed or carried away than in nests where the cowbirds are allowed to stay. Scientists Jeffrey Hoover and Scott Robinson designed an experiment to test their idea that cowbirds are retaliating when their eggs are removed, by returning to the nests and destroying the warbler eggs. The researchers used warbler nest boxes in Illinois that are set atop greased poles to keep out raccoons, snakes, and other ground-dwelling predators. For years the warbler nests had been parasitized by cowbirds. When the cowbird eggs were allowed to stay, only 6% of the warbler nests were vandalized. But when the researchers removed cowbird eggs, a whopping 56% of the warbler nests were damaged by marauders. To test their theory that the vandals were cowbirds, the scientists removed all the cowbird eggs but put new fronts on the warbler nest boxes with holes too small for the adult cowbirds to re-enter. The warbler nests remained intact. So the nest-molesters were cowbirds. A parallel situation exists between cuckoos and the magpies that parasitize cuckoo broods in Spain. Magpies also retaliate by trashing the cuckoos' nests if the magpie eggs are kicked out. What's a parent warbler to do? The best strategy is to work like hell around the clock and raise those cowbird chicks as well as their own. The fact is, because of cowbird retaliation, warbler nests with the cowbird eggs removed produce only 40% as many warblers as the nests that retain the cowbirds. It doesn't pay to cross those gangster birds. Is brood parasitism a threat to the species survival of smaller songbirds such as warblers? In the past it hasn't been, because most of the parasitized species have habitat preferences that generally take them beyond the reach of cowbirds, such as deep extensive woodlands. Cowbirds avoid deep continuous forests. They prefer agricultural or residential landscapes near scattered trees or woodland edges. Such edges are created when deforestation leads to fragmented forests and open brush or grassland. Unfortunately, North American forests are becoming more and more fragmented due to the paper and timber industry, and due to development from the growth of our human population. 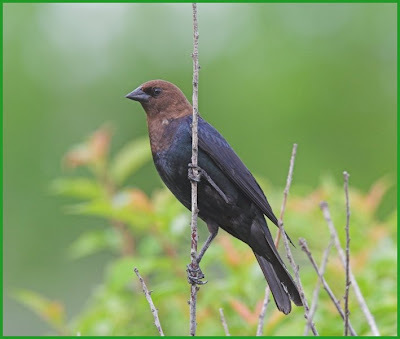 So warblers and other small songbirds that are the most common targets of cowbird brood parasitism are losing their refuge from cowbirds, forced to nest in forest fragments that are easily penetrated by edge-seeking cowbirds. What can you do? Contact the director of the division of natural resources in your county or state and ask what you can do to encourage the perservation of large tracts of continuous forest. Ask what opportunities there are for citizen input into land-use planning on public lands. 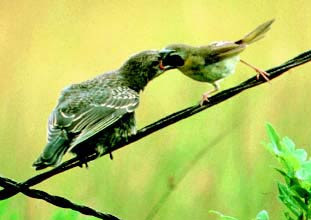 A parent warbler (right) feeds a bigger cowbird chick (left). Susan Milius. March 10 2007. "Mafia cowbirds: do they muscle birds that don't play ball?" Science News 171: pages 147-8. Many Americans assume that women in the U.S. military are stationed far from the fighting. While it's true they can't train for frontline combat positions, the changing nature of the Iraq war has placed many women at the center of the conflict. Yet the women serving and dying for the U.S. have received very little attention. Who are they, why did they join and what are their experiences and points of view? On this edition, Sarah Olson speaks with veterans of the U.S. Army, Navy and Marines, and to one active duty soldier who served for a year as an Army journalist in Iraq. Each woman has a unique story, but all share an understanding of the power politics of the U.S. military and the price that is paid by women seeking to serve their country. Anuradha Bhagwati, Former Marine Captain; Maricela Guzman, Former Information Technician in the U.S. Navy; Linsay Rousseau Burnett, Sergeant U.S. Army, first brigade combat team 101st Airborne division; Stefani Pelkey, Former Army Captain. A life sized blue on your desk top is the latest initiative designed to raise awareness about the risk to whales from on-going whaling by countries like Japan, Norway and Iceland. The Whale and Dolphin Conservation Society, has announced the runaway success of its latest awareness-raising initiative; a life-sized blue whale on the web. The banner, as part of WDCS’s Stop Bloody Whaling campaign, gives viewers a glimpse of a life size animated blue whale, the largest animal ever to live on Earth. The campaign highlights the growing danger to great whales from a cruel and increasingly aggressive commercial whaling industry. The animated whale banner can be seen at www.whales.org. “The response we’ve had has been overwhelming”, says Lindsay Bruce, IT Manager at WDCS. 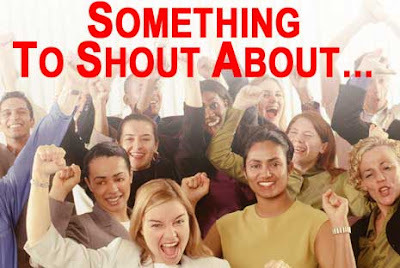 “Now we’re finding that our hosted solution is close to saturation as demand for the banner really takes off. We hoped the banner would be popular, but seeing this level of public interest is both gratifying and creating a real technical problem. The banner has registered over 90,000 downloads of the animation in the past week and we have been inundated with requests for a version to use as a screen-saver. We’re now looking for a generous IT partner who can help us host this. Clearly it’s made an impact on the public and we want it to stay up, but we don’t have the infrastructure to cope with the demand”. 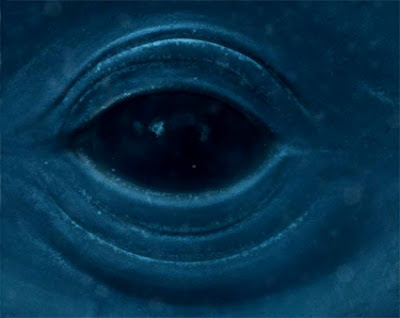 Created by the German ad agency “Jung von Matt” in Hamburg with the help of "Soulpix 3D animation", the blue whale animation is composed of 10,000 JPEG images stitched together to illustrate the enormous size of these marine mammals. An ingenious Flash engine downloads the images on demand as the whale “swims” slowly across the screen. The completed image is over 80Mb in size. In the twentieth century, whaling pushed many species to the very brink of extinction. In the Antarctic alone, between 1904 and 1978, 1.4 million whales were killed. This number includes the 350,000 blue whales taken by whaling fleets during that time. Thousands more were killed and not reported. With populations slow to recover, these giant creatures are now classified as endangered with some populations in the Antarctic numbering just a few hundred. Many other populations of whales were similarly decimated. I want to go to Africa. There is little that I want more, other than the health of my children. For someone who loves wildlife and is intrigued by cultures different from my own, what destination could be more compelling? The fact that Africa's ecosystems are in serious peril makes me all the more desperate to get there before it's too late. I read yesterday, in an article from Emmanuel Koro of the World Resource Institute, that African conservation areas like Kruger National Park could risk losing up to 60% of their species as a result of the coming climate change. But ecological changes will impact human communities just as much as the they affect the natural world. The early stages of climate change already exacerbate sub-Saharan Africa's pervasive and increasing poverty, through drought and subsequent crop failure as well as degradation of natural resources. Poverty is one result of natural resource depletion and degradation, but poverty also causes resource depletion. Some of these causes are obvious, some less so. For example, poverty together with political instability means that social programs to improve options for women are often grossly underfunded. Women without access to education, health care, and employment, and the autonomy those opportunities bring, tend to marry in their teens and have large families. Larger families lead to rapid population growth and contribute to the consumption of natural resources at unsustainable rates. The high rate of HIV infection in sub-Saharan Africa also contributes to increased reliance on forest resources. Poverty feeds habitat destruction; habitat and natural resource depletion feed poverty. The problems facing sub-Saharan Africa are daunting. Below, from the World Resource Institute, is a profile of one family's struggle to make a living, to survive, as forest resources dwindle. Their plight is difficult to fathom in the relative comfort of our 2200 sq ft (average) American home. But it puts a face on the challenges of rural life in an impoverished nation with an average income of less than $2 per day. (Blantyre, Malawi, February 2004) At 2:30 in the afternoon the Dyeratu family has just clambered down one of the highest mountains near Blantyre, the commercial capital of Malawi. Idan and Feligasi Dyeratu and their daughter, Gertrude, began the trek up the 1,400 meter-high Mount Michiru at sunrise on empty stomachs. Eight hours later and a little more than half way home, they have stopped to take a rest under a Eucalyptus tree, each burdened with a load of firewood that they carry on top their heads. As Blantyre has grown in size and population -- almost tripling in the past decade -- the forests that blanketed the two mountains around the city have been under increasing pressure. Already the trees shrouding Ndirande Mountain have been entirely cleared for fuel wood and brick making. Families are now hiking to the forests on Michiru for their fuel. In Malawi, 93 percent of energy comes from fuel wood. Under this pressure, deforestation is not just an ecological threat; women are negatively affected as well. 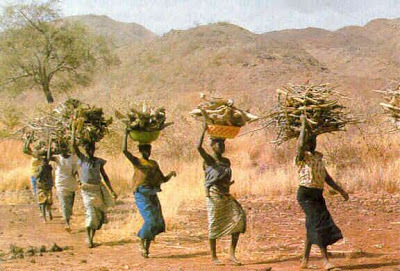 Traditionally, it is women's work to gather wood for cooking. Increasingly, they have to walk long distances to gather firewood. This has consequences for the entire family: as firewood becomes scarce, the nutritional status of families often declines. Limited supply of fuel and energy forces many families to reduce the number of meals they eat and to prepare food that requires less cooking, which is often less nutritious. Idan says his family climbs the mountain every Saturday so he can sell the wood in the densely populated township of Chirimba. They purchase loads of firewood from forestry officials that are managing a plantation on Mount Michiru. "The exotic pine plantation is benefiting us a lot," said Idan. "I make a profit of about 400 Kwacha [about US$4] per head load carried down the mountain after buying it at 15 Kwacha from forestry officials." A recent survey conducted by the Wildlife and Environmental Society of Malawi identified poverty as both a major social problem faced by local people, and as a serious cause of pressure on the environment in Malawi. According to William Chadza, head of the organization's natural resources management program, poverty and lack of resources "lead the people to use available natural resources unsustainably." Chadza cites charcoal production as an example. Around the country, rural communities are rapidly burning their forestlands to produce charcoal, which is in high demand in cities. To make 50 kilograms of charcoal requires 250 kilograms of wood. The disappearance of forests has resulted in massive soil erosion and siltation in low-lying areas resulting in floods during heavy rains. Increased flooding and siltation not only threatens rural communities, it has disrupted operations at the biggest hydroelectric dam in the country, resulting in power outages. The UN's 2000 Human Development Report ranks Malawi as one of the 10 poorest countries in the world -- 163 out of 173 nations. About 65 percent of the people live below the poverty line, and 28 percent suffer from "severe poverty." Malawi has a population of about 12 million, with most of the population living in rural areas. Nearly 85 percent of the population is dependent on agriculture, and in 2002 more than half of those people were not able to produce enough food to feed themselves the entire year. While the country has taken measures to address poverty -- launching a poverty-monitoring system to inform and oversee poverty related issues -- the rapidly growing population continues to exert pressure on the country's natural resources. Until recently, Malawi was home to more than a million refugees from Mozambique refugees who fled armed conflict in their country a decade ago. Further, an influx of firearms from the conflict has helped poachers finish off elephants in Majete wildlife reserve and the Black Rhino in the Mwabvi Wild reserve. Charles Mkoka (cmkoka@mw.loita.com) is a freelance writer based in Malawi and a contributor to WRI Features. In later blog posts here, you can read how conservation organizations such as The Nature Conservancy in partnership with the African Wildlife Foundation, the Jane Goodall Institute, and the Green Belt Movement are working to develop incentives to help rural Africans protect natural resources in ways that also support their families. The challenge is immense, but the progress is encouraging. Because poverty and resource depletion are so intricately linked, any solution must address both. To be in some way a piece of that solution......what could be more gratifying or more meaningful? Africa lost nine per cent of its trees between 1990 and 2005, according to a UN survey of the world's forests. This represents 0ne half of the earth's forest loss, this despite the fact that the continent accounts for just 16 per cent of the earth's forests. In a news release this week (13 March) by the UN Food and Agriculture Organization, it was reported that the highest losses occurred in countries with the densest forest cover: Angola, Cameroon, DRC, Nigeria, Sudan, the United Republic of Tanzania, Zambia, and Zimbabwe, all in Africa. Although forests are obtaining greater political support and commitment in Africa, the report says "implementation and law enforcement remains weak in most countries". In Latin America and the Caribbean, home to a quarter of the world's forest cover, 0.5 per cent of forest was lost each year between 2000 and 2005 ― up from a rate of 0.46 per cent in the 1990s. 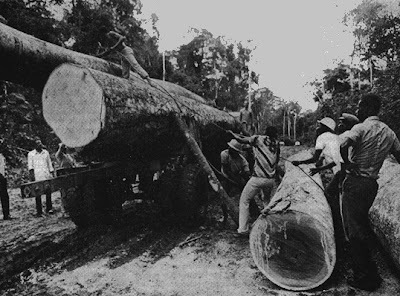 The conversion of forest to agriculture was the leading cause of deforestation. Costa Rica, however, reversed its forest decline in the 1990s subsequently realizing a growth of of almost one per cent of forest area expansion per year. But the extent to which this is related to reductions in agricultural land or innovative policies is not clear, warns the report. Here's your chance to meet other global-warming activists in your own community. The website Step It Up! 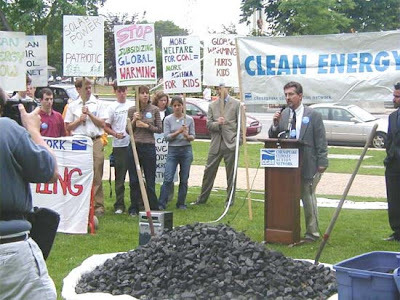 2007 is promoting a "national day of climate action" on April 14, 2007. Great idea, and a desperately needed action. Already 920 events are planned in 50 states. The Step It Up 2007 website has an interactive map that allows you to locate the event closest to your home. Step It Up! is pushing Congress for an 80% reduction in carbon emissions by the year 2050, which is just a 2% reduction per year. "The latest science tells us that temperatures are increasing faster than expected, and the results are showing up in melting ice caps, intensifying storms, and rising sea levels. America's foremost climatologist, NASA scientist James Hansen, has said that we have just a few years to start reducing carbon emissions, and he's endorsed our goal of 80% by 2050. That won't prevent global warming - it's already too late for that - but it may be enough to stave off the most catastrophic effects. "While few experts have said explicitly 'we need to reduce carbon emissions 80% by 2050,' we're sticking to this message. Here's why: Scientists have resisted in nearly every case prescribing policy because they don't want to enter the political realm. That's why the Intergovernmental Panel on Climate Change (IPCC) and others won't suggest policy, but rather leave it up to legislators to do the dirty work. That said, Jim Hansen, the Stern Report, the UN Framework Convention on Climate Change (UNFCCC), a number of European countries, the State of California and others (including the new USCAP business-environmental partnership) have either suggested or explicitly referred to 80% carbon cuts by 2050 as a solution commensurate to the scale of the problem. "And it's possible. The cost of renewable energy is falling fast. New conservation technologies, like hybrid cars, are becoming more available. Many Americans are starting to switch already, but only leadership from Washington can allow this transformation to happen fast enough. And if we begin to get our house in order, then we can play some role in helping China and India steer away from cataclysm as well. "There are no guarantees we'll succeed. But if we act ambitiously, we have reason to hope." Step It Up's website (link above) also has suggetions for how to plan an action near you, if there isn't one already planned, and other steps you can take to reduce our contribution to climate change. Americans are right now the world's biggest producers of the greenhouse gases that are warming the planet. But we're not helpless to stop it. Any given evening of channel-surfing is likely to turn up a show on African wildlife....hyenas scuffling over a zebra carcass, meerkats socializing, cheetahs chasing antelopes. We're fascinated with African wildlife. Of course we are. No other continent offers the variety of "charismatic megafauna" found on the African savannah. Troll the internet for safari prices, and you'll find many African packaged trips for $7,000 to $12,000 per person. 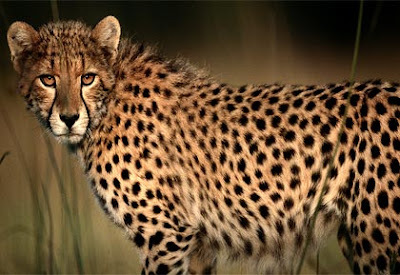 But Americans continue to pony up because we're entranced by the grandeur and drama of African wildlife. Yet Africa is a continent in serious crisis. It's the only continent where poverty is actually increasing. More than 70% of the world's HIV infection is in sub-Saharan Africa. The AIDS epidemic, as you probably know, has killed so many people in Africa that a large proportion of households in sub-Saharan Africa are missing one or both parents. In many cases, a child or granny is the head-of-household. The disruption of family and village life by the AIDS epidemic has profound ripple effects throughout African culture and the natural world. Traditionally, rural villages have relied heavily on forest resources, especially fuelwood, but also plants for traditional medicines, and bushmeat, or wildlife for the dinner table. In some countries in sub-Saharan Africa, more than 90% of household energy is from locally gathered wood. For centuries, villagers have harvested only dead branches, and the wood has come from the village commons - the communally owned area around each village. The harvesting of fuelwood, bushmeat, medicinal plants, wood for fencing and household implements and furniture, etc. has been at sustainable rates. But families without a breadwinner tend to increase their use of forest resources, because such resources are free. In addition, the human population in east Africa is projected to double in the next 55 years or so. So the demand for forest resources is increasing for a number of reasons. The use of many of these resources, including trees for fuelwood, has surpassed sustainable levels. In South Africa, some studies have shown that at current rates of use, fuelwood resources will be exhausted within 15 years. The demand for arable land is also increasing as human populations increase. Conflicts between the needs of human communities and the needs of wildlife for habitat grow more pressing. Many rural villages depend on livestock for their livelihoods. In east Africa - Kenya and Tanzania - predation on livestock can be a major source of friction between wildlife conservation efforts and community interests. In southern Africa, elephants often damage farm fields, and even invade villages, sometimes killing people. The Nature Conservancy is working with the African Wildlife Foundation toward solutions to these problems. The key lies in finding incentives for local Africans to preserve natural resources, including wildlife, and in finding ways that African villagers can improve their livelihoods through resource conservation. That is a major challenge for the century that lies before us. On June 5 of 2006, Voice of America's Cole Mallard interviewed Adam Henson of the African Wildlife Foundation on the conflict over the use of natural resources by humans and wildlife in Africa, and solutions that AWF is trying to facilitate. Following is a link to the audio of that interview (less than 2 minutes long) and a written summary of the interview from the website of the African Wildlife Foundation. Humans vs. Wildlife: How Serious Is the Race for Resources? "Tonight, in our continuing series on the competition for resources between humans and wildlife, these questions: How serious is it? Can a compromise be worked out? Voice of America English to Africa reporter Cole Mallard put those questions to Adam Henson, a program manager with the African Wildlife Foundation in Washington, who said Human-wildlife conflict is one of the most serious threats facing conservation efforts in Africa today. Our mission is to work with the people of Africa to insure the wildlife and wildlands of Africa will endure forever through strategies that create incentives for conservation and opportunities for people to earn a living. "He says the cause of the conflict is competition for resources between wildlife and people, such as water and grazing areas. Henson says the kind of conflict depends on the region. For example, in East Africa, lions and other large predators devastate livestock, whereas in Southern Africa, large elephant populations raid crops, destroy houses and sometimes kill people. "He says the way to deal with conflict is through prevention and mitigation. He says prevention involves improving livestock husbandry, and containing of livestock from predators such as lions. He describes mitigation as financial compensation for economic loss resulting from destructive wildlife behavior. "Henson says it's not the role of the Africa Wildlife Foundation to promote or oppose sport hunting or other similar activities, but to promote a wide range of economic activities that are derived from conservation and that create benefits for local people that can, in the end, sustain livelihoods and, most importantly, protect conservation of wildlife." Twine, Wayne. "The rural fuelwood crisis: sifting through the myths." Kruger Park Times. October 4, 2004. In this program, we visit with three eloquent members of the International Council of Thirteen Indigenous Grandmothers. 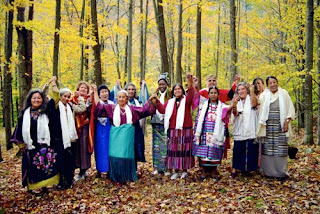 The Council is a global alliance of elder women healers who represent more than 900 years of collective wisdom and traditions. The women come together to speak in one voice, with one very simple, yet urgent message: we must take care of our Mother, the Earth, for the next seven generations. This Women's Desk program is a special collaboration with the Women Rising Radio Project, Lynn Feinerman and Crown Sephira Productions. Rita Pitka Blumenstein of the Yupik nation practices plant and energy medicine. She is on the staff of Anchorage's South Central Foundation Traditional Healing Clinic; Flordemayo is a Mayan curandera, or healer, and serves on the board of the Institute of Natural and Traditional Knowledge in New Mexico; Beatrice Long-Visitor Holy Dance is an elder in the Native American Church, a sundancer and a health worker with the Lakota Oglala people. Later than the latest homework assignment, more inadequate than the most half-hearted school project, the US’s upcoming climate change report is expected to disappoint climate scientists around the world. The report, required by the United Nations Framework Convention on Climate Change, was due to the UN no later than January 1, 2006. Yes, 2006. Nonetheless, it is currently still under review by the White House Council on Environmental Quality. This reluctance is rather understandable, given the degree of action that an honest assessment would necessitate. The UN’s own report, released last month, stressed more harshly than ever the drastic need for a significant worldwide reduction in greenhouse gas emissions. Although the US ratified the report, along with 112 other nations, the administration has yet to appropriately address the gravity of this news. The US’s current emissions policy calls for limiting the nation’s rate of increase to 19% – which still allows emissions to increase from 7.7 billion tons in 2000 to 9.2 billion tons by 2020. This slowed rate of increase is simply not enough, according to Washington’s own Climate Institute. “We really need to be seriously reducing emissions, not just reducing the growth rate, as the president is doing,” says Michael MacCracken, the Institute’s chief scientist. It’s easy to understand why the administration, and indeed, the American public, is hesitant to admit the decisive stance that is truly needed. After all, the greatest sources of greenhouse gases are coal, oil, and natural gas – the very fuels that support almost every aspect of the comfortable American lifestyle. Acknowledging the gravity of the true need for change is going to require a serious policy change from the government and citizens alike. Both the U.S. Climate Change Science Program and the Climate Science Watch offer continued monitoring of the report’s progress, as well as further information on climate change in the political arena. Researchers say that Western scrub jays are the first animals to unambiguously meet the criteria for "planning" behavior. Scientist Nicola Clayton of the University of Cambridge in England reported her observations in the Feb. 22 issue of the journal Nature. The birds in the study were seen to store food in places where they were previously stuck with nothing to eat. They also were observed to cache certain kinds of food in spots where that kind of food had not been available in the past. In humans, planning is the result of imaginary time travel. Whether the birds were engaging in imaginary time travel can't be known for sure. But behavior that seems to result from imaginary time travel has never been reported for any animal in research journals before now. To set up the study, Clayton and her colleagues housed the jays in suites with two annexes. On some mornings, the researchers confined a bird in one of the annexes for 2 hours with no breakfast. On other days, the researchers kept the bird in the other annex, where food was available. So the birds knew which annex had food and which didn't. 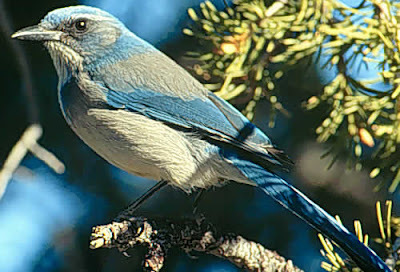 For the experiment, the researchers served whole pine nuts to the jays. The birds could eat as many as they liked and cache the rest in either annex. The 8 birds in the test cached most of their nuts in the no-breakfast annex. In a second experiment, the researchers offered the birds peanuts in one annex and kibble in the other. The birds cached more of each food in the annex that lacked it. The researchers say the results show that the birds planned what they would have available to eat for future meals. Other scientists - Sara Shettleworth of the University of Toronto and Thomas Suddendorf of the University of Queensland - concur with Clayton that the results show strong evidence of planning, much more so than previous behavioral experiments. This behavior is different from, say, a dog running to the door at the sound of a car in the driveway, which is simply a response to a conditioned stimulus. It is also different from a cat lying next to a chipmunk hole, which may seem to be planning but is actually a hunt already in progress. This behavior is not the same as a squirrel hiding nuts, either, which can be explained as just instinctive behavior with no imaginary reflection on how satisfactory the nuts will be at a future time. The caching by Western scrub jays does seem to show "imaginary time travel" to events that could be weeks away - events which require some menu-adjustment in order to satisfy the choosy diners. Source: S. Milius. "Bird plans." Science News, Volume 171. February 24, 2007. You’ve probably heard the news by now that the NC Utilities Commission yesterday approved only ONE 800-megawatt unit for Cliffside. Thanks to all of you for attending the hearing, providing public and written comments, getting friends and family to submit comments, writing letters to the editor, talking to people about the importance of moving away from fossil fuels and toward clean energy and energy efficiency, and all the other ways you contributed to making sure the Utilities Commission heard the public’s concerns. I am convinced that without the large turnout at the hearing in Charlotte and the many comments sent in, that the Commission would have no doubt approved both proposed units. So thank you for your part in this critical campaign to fight global warming pollution here in North Carolina! 1) Duke stated under testimony that it would be cost-prohibitive to build just one unit. In the paper this morning Duke Carolinas President Ellen Ruff, stated that “We have to look at where we are.” She said they could choose to build more natural gas plants. So we will keep you posted on the latest developments. 2) Duke still needs to get an air quality permit from the state Division of Air Quality. In terms of concerns over air quality and global warming, we have better legal standing with the DAQ than with the UC on these issues. There may be a public hearing on this. 3) We now have the Charlotte Observer, the Raleigh News and Observer and the Winston-Salem and Durham papers on record as opposing Cliffside. 4) We also have the attention of the state legislature which is considering legislation that NC adopt a RENEWABLE ENERGY PORTFOLIO STANDARD that would require utilities to have a certain percentage of their energy portfolio met through energy efficiency and renewable energy sources. ACTION: We need folks to thank Rep. Becky Carney, Rep. Martha Alexander and Rep. Drew Saunders for co-sponsoring House Bill 77 which would ensure that at least 20% of North Carolina’s energy demand is met through efficiency measures and clean, renewable sources by the year 2020. Contact your specific legislator in the house and ask them to support this bill. FOR YOUR READING: You should know that Susan Tompkins of Charlotte is a member of the N.C. Legislative Commission on Global Climate Change. She is a wonderful advocate on our behalf. I’ve attached a Summary of Proceedings from their meeting on February 22. Please read over these and get familiar with the types of policy changes we need to support to reduce our carbon emissions in North Carolina and thank Susan when you see her! Thanks again for using your voice to help the Carolinas Clean Air Coalition restore clean and safe air to the Charlotte region!